In honour of KFC’s horrific Double Down sandwich setting some kind of sales record in its first two weeks in Canada, I have decided the sandwich is ripe for miniaturization. 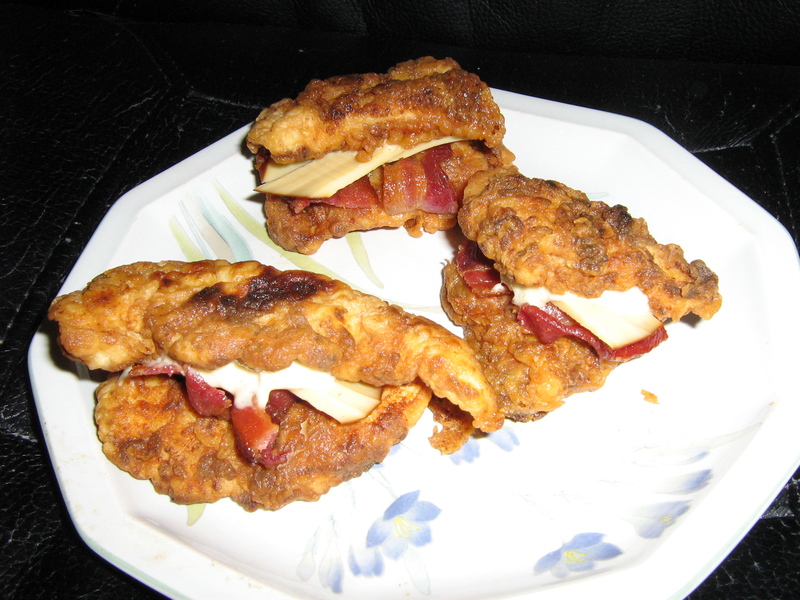 If you haven’t heard about the Double Down, it’s bacon, cheese and “special” sauce sandwiched between two “buns,” which are actually just boneless breaded fried chicken. Monstrous. Anything that starts like this, should progress very well indeed. Whether you’re starting with a tin of snails or a batch of beloved shelled and poached garden vermin, this is the good bit. Even though they’ve been boiled already, once out of the shell, snails still need to be cooked. 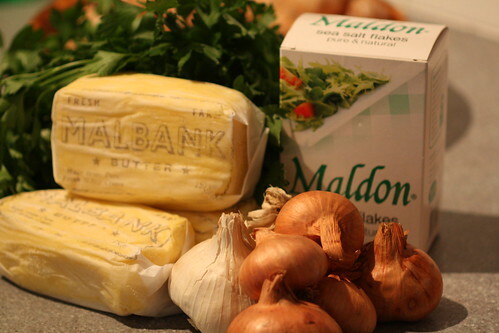 There are lots variations on what exactly escargot can be poached in, but the goal is essentially to cheat a court bouillon. It is a matter of preference, but I go for a red wine base. 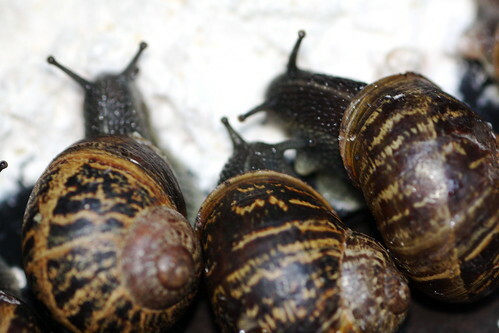 Helix aspersa, eating comfortably in captivity. Last Spring I got frustrated with replacing my herb seedlings weekly, and made an effort to rid my potted garden of the scourge of hungry snails. In a search for the perfect species-directed pesticide, I identified the particular species of nocturnal basil-destroyers as Helix aspersa*. That’s where my poisoning plan took a hard right turn. Helix aspersa, it turns out, are one of several European native terrestrial snails that are edible. Delicious, even. The French call them “Les Petits Gris”, and favour them over the larger species Helix pomatia. Introduced to England from Italy by the Romans, they were regularly eaten well beyond WWII by poor East-Londoners who used a meal of snails to get around the Anglican Church’s no-meat-on-Friday rule – by dubbing them “wall fish.” Such rich history behind these varmints. I thought I’d share my tactics for shopping for candy corn to help those of you in North America* make the most of the Halloween candy shopping preseason (ok, so I guess it’s not really the preseason anymore now that it’s October). My tactics are based on years of research, though not the 30+ years (ahem) you might expect. I was ambivalent about candy corn when I was younger and I got sick of it pretty quickly. I didn’t start craving it until I left home and my cravings got stronger when I moved abroad. Now it is the only reason I get excited about Halloween. 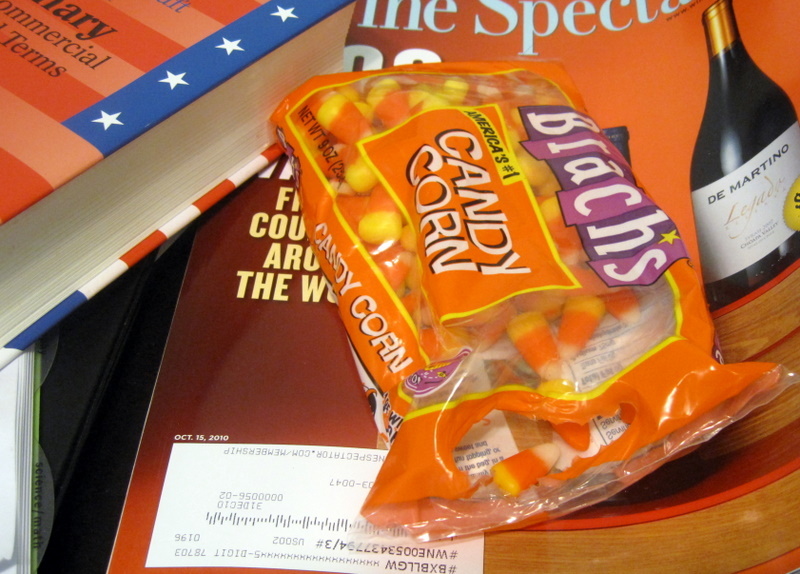 Candy corn on my desk: these days it’s impossible to work without it.